Posted on May 25, 2018 at 6:54 am. I patiently wait for this time of year at the Farmer’s Markets and grocery stores: asparagus season! 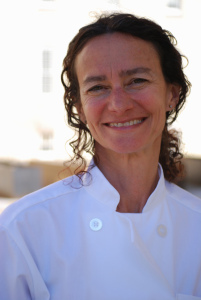 It is the beginning of all things good, healthy and local. Asparagus can be eaten all year if you choose, but there is nothing like fresh, local asparagus from right here in Michigan. To me, all veggies taste better when they are in season and local. Less travel = more flavor and nutrients! What about the benefits for runners? Asparagus has vitamin K, which is beneficial for bone health; folate, which promotes healthy blood cells; and and vitamin C, which helps the absorption of plant sources of iron. It is also a good source of fiber and antioxidants. Asparagus is best eaten as soon as you get it home. But if you have to store asparagus, treat it like you would a bunch of flowers. Place in a cup of water with the stalks standing straight up, then put it in the fridge. Asparagus comes in all sizes, from slim, pencil-thin to big fat ones, and the size has nothing to do with their age. And both sizes are great — I like to choose which size depending on how I’m going to cook it. Or if I can only get one size, then I’ll adjust how I will cook it. Thick spears are more tender than thin spears, but can get a little watery if you steam or boil them. They are best when grilled, roasted and sautéed. Thin spears tend to be more intense in flavor and less watery. They’re also a little bit tougher and snappier, which makes them best for blanching, serving cold, stir-frying or raw. Roasting or grilling can dry them out, so be careful here and adjust cooking times. I have two recipes for you today. 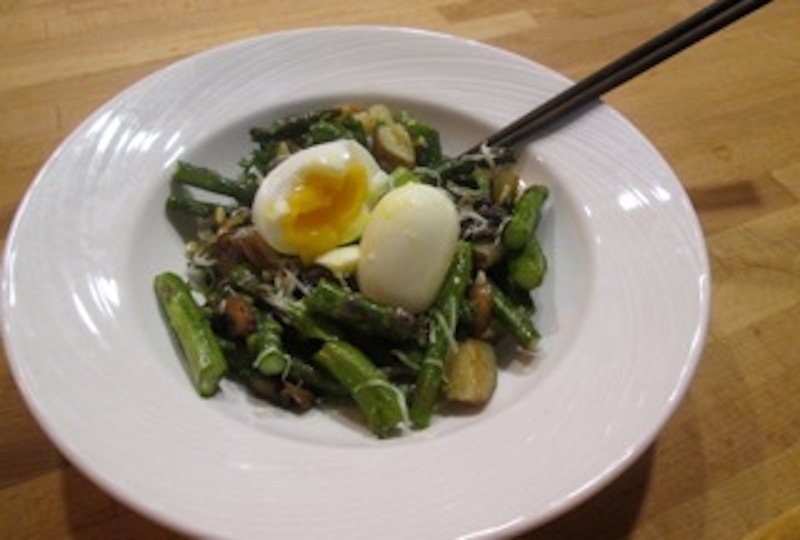 The first one is a quick and easy one-bowl meal starring asparagus and mushrooms. Feel free to use morels if you are lucky enough to have a secret stash! Break the ends off your asparagus and cut into 2-inch pieces. Slice mushrooms not too thin and not too thick. Heat just enough olive oil to coat the bottom of your skillet, over medium heat. Add your mushrooms and cook until they start to soften and brown a little. Then add your onions, garlic and asparagus. Sprinkle on some salt and a few grinds of pepper. Cook until the onion and garlic softens and the asparagus gets bright green and starts to brown a little. Taste and season again if needed. Top with fresh parmesan. You can serve the veggies on top of a bed of quinoa (or another grain) with or without a fried egg on top. Or you can serve it without the grain and just add the egg on top. Or you can toss this with pasta … the possibilities are really only limited by your imagination. And the second recipe is a one of my favorite breakfast sammies. Toast your bread and butter it generously. Cook your eggs how you like. 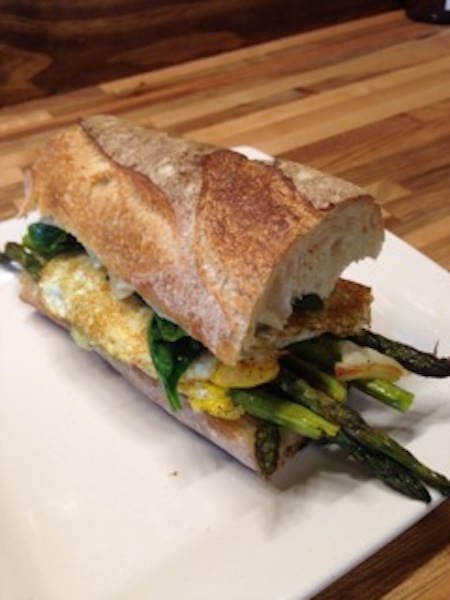 Sometimes I like this with fried eggs and whole roasted asparagus spears and sometimes I like this sammie with the eggs scrambled, seasoned with salt and pepper and then at the last minute tossing the shredded cheese and leftover sliced asparagus into the pan to heat it all up. Pile it all on one slice of bread and top with the other slice. If you had some leftover bacon, avocado or really amazing tomatoes that would be good here, too. Eat and enjoy!